I love shooting pictures. This summer, I went to Amsterdam with a friend to do a photo shoot. We always decide to make pictures based on a specific subject or theme. There is always a good subject to select around the beautiful canals in the center of Amsterdam. However, it struck me to see that every two or three steps (yes! ), you’ll observe litter on the street! Seeing = shooting, so a small personal impression is shown in figure 1 below, but believe me I have a lot more! The Pearce Research Group at Michigan Tech has made yet another significant step in making 3D printing a more sustainable practice. Though the university lab has made a good deal of progress in developing low-cost 3D printing hardware – including a plastic-recycling filament extruder, a solar-powered 3D printer, and a sub-$2,000 metal 3D printer – some of its most important contributions to the sustainability movement lay in research and standards. InnoCircle, a joint project between Dutch filament manufacturer Innofil3D and CiorC, is the latest development in the sustainable 3D printing market. The companies have created a line of unique monofilaments made from recycled ABS car parts and PET water bottles that complete two separate sustainability ‘loops’ within the plastic product manufacturing industries, thereby reducing waste and contributing to a more ecologically-friendly environment. Stratasys recently announced its new recycling program, which offers our North American customers the ability to recycle their FDM canisters and PolyJet cartridges free of charge. Stratasys’ North America customers can now recycle Stratasys material waste quicker and easier than ever before. Our Recycling Program helps you avoid logistical headaches, reduce waste, save space and eliminate shipping costs. And by recycling you also support people with disabilities in our community. To start recycling today simply go to our webpage (www.stratasys.com/customer-support/recy­cling-center). Watch as the CRUNCHER from ExtrusionBot grinds up old 3D prints and water bottles to be reused! ExtrusionBot is in the business of supplying 3D printing enthusiasts with materials. 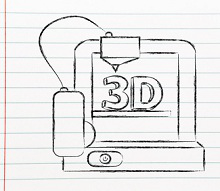 Breaking into the 3D printing industry with their specialized ExtrusionBot filament extruder that can be used with any desktop 3D printer, the new — and highly popular — company is keeping forward momentum with innovations for user filament production, and always leaving a smaller footprint. The 3D printing industry has long-awaited a fully motorized 3D print reclaimer that could break down failed 3D prints into reusable material. With that in mind, ExtrusionBot introduces our new and fully motorized 3D print recycler, “The Cruncher” – an industry first! The Cruncher can be used in conjunction with the ExtrusionBot EB2 filament extruder or independently. The Cruncher is much more than just a print shredder. It is a true, miniaturized pelletizer. The internal classifier screen of The Cruncher ensures the total uniformity of crunched material as it is processed. This uniformed mixture provides more consistent sized pellets to your filament extrusion machine. Additionally, finer and more complex mixture ratios can be achieved using our 3D print recycler. Visit our Kickstarter campaign to learn more and show your support! ProtoCycler is an innovative company with a fun, seriously useful product for 3D printing enthusiasts—and especially the ones who get both a kick out of and great satisfaction from recycling.